Bald’s Leechbook, British Library (Royal 12 D xvii)). 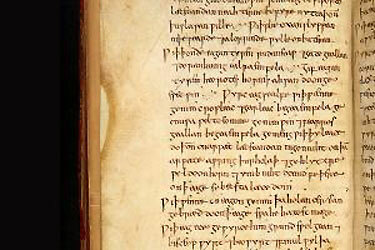 Scientists recently experimented with a recipe from Bald’s Leechbook aka Medicinale Anglicum an Old English medical text probably compiled in the ninth-century and found that a compound recommended for a common eye infection worked just as well as the modern antibiotic used to treat Methicillin-resistant Staphylococcus aureus (MRSA). Sourcing authentic ingredients was a major challenge, says Freya Harrison, the microbiologist. They had to hope for the best with the leeks and garlic because modern crop varieties are likely to be quite different to ancient ones – even those branded as heritage. For the wine they used an organic vintage from a historic English vineyard. As “brass vessels” would be hard to sterilise – and expensive – they used glass bottles with squares of brass sheet immersed in the mixture. Bullocks gall was easy, though, as cow’s bile salts are sold as a supplement for people who have had their gall bladders removed. It wouldn’t be the first modern drug to be derived from ancient manuscripts – the widely used antimalarial drug artemisinin was discovered by scouring historical Chinese medical texts. One Feedback on "Old English Medical Recipe Kills Bacteria as Well as Modern Antibiotic"
Count me as skeptical. In general medicine and pharmacology when this “drug” was created revolved around superstition and outright fraud/quackery. That some “natural” substance could kill germs isn’t revolutionary, I could list a dozen or so off the top of my head but would consider using one of these in a life or death situation in preference to a modern antibiotic. I’m certainly OK with investigation of something like this but the trend seems to be that the media will hype it far beyond it’s actual value and that the quacks out there will use the hype and natural superstion to bilk millions and even prevent them from seeking lifesaving medical care.